With the prices of gas skyrocketing, powering up that old, noisy gas-powered lawnmower may sound less appealing than ever. Thanks to Black and Decker’s line of electric lawnmowers, there is now an alternative to those gas-powered relics. For those who will not be mowing acres and acres of land, these affordable and practical mowers will get the job done quietly and odor free. 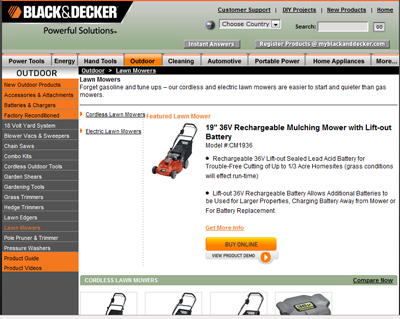 Black and Decker’s line-powered electric mowers are the most affordable in their line of electric mowers. Although you will have to adjust to being tethered to an extension cord, the trade off on costs of gas, oil and tune-ups makes it worth the extra inconvenience of the wire. Take a look at one of these affordable mowers that should easily meet the needs of someone who has only a small area of grass to cut. The most basic of Black and Decker’s Electric models is a perfect lightweight companion to keep a small yard properly groomed. This simple yet elegant solution starts with a simple turn of a key. No need to exert yourself pulling the rip-cord to get this mower going! This mower can mow between 1” and 3 1/2” height giving you the basics you need for a price you can’t beat. This mower supports both bagging of clippings or side discharge. The Rear Bag Mulching Mower is a step of from the basic 18” model. You get the same light-weight design and instant start technology plus a powerful motor with a three-in-one deck solution that supports bagging, side discharge, and even mulching. The deck can be adjusted between 1 1/4” and 3 1/2” level and has a lifetime guarantee against rust. The Rear Bag Mulching mower also folds up nicely for easy storage in your garage or yard shed. Black and Decker’s wireless lawnmowers are an amazing innovation in lawn care technology. Just like you can charge up your cell phone and take it on the go, the Black and Decker wireless electric motors can be charged up in a wall socket and then used to quietly cut your lawn without having to worry about any cords. These models will run you a bit more than the wired models, but the freedom of movement and quiet operation are well worth the extra money. This light weight electric mower provides mulching, bag discharge and size discharge with a simple interchangeable deck attachment. The deck is easy to clean and guaranteed not to rust by a lifetime warranty. A single battery charge will handle between 10,000 and 12,000 square feet. This is plenty for the average homeowner’s lawn. The battery takes between 4 and 8 hours to charge, but 4 hours gets you about 70% battery life. The whole unit folds up into a vertical position for easy storage. This is the deluxe model of wireless lawnmowers in the Black and Decker line. This machine allows mulching, side discharge and bag discharge with the proper attachments. A single charge will let you cut up to 12,000 square feet. But, if you need even more than that, the battery can easily be switched out with another one, meaning this mower can handle a yard of any size if you keep a spare battery charging! This mower also has a comfortable, padded grip that adjusts to your posture to make your lawn mowing experience as comfortable as possible. You’ll be doing the environment a favor when you replace your old gas-powered mower with one of these amazing, lightweight mowers. All Black and Decker electric mowers are certified emissions free and the batteries are certified with the Energy Star Saver approval. The battery and charger meet the strict guidelines of US Environmental Protection Agency and the US Department of Energy and Black and Decker supports recycling and recharging of the batteries. Do your part to care for your lawn while caring for the environment as well. Black and Decker’s electric mowers are definitely a step in the right direction!